GloFish are brightly colored fish that are perfect for anyone new to the fish keeping hobby. 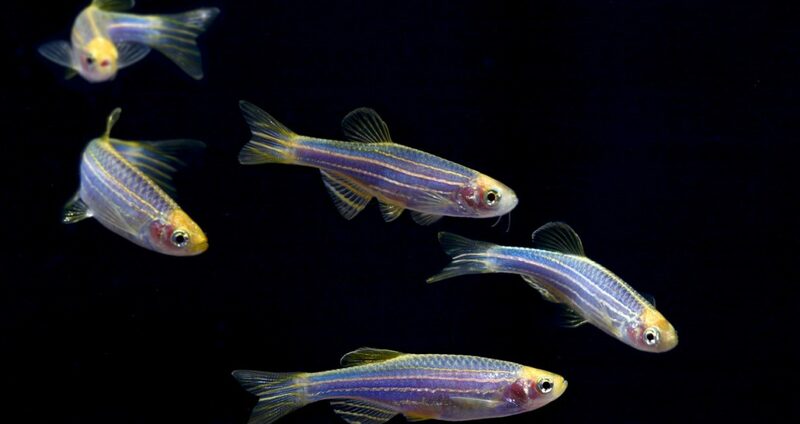 At first, GloFish were originally only available in one species, the Zebra Danio. Now they come in four different species that range in size from 2 to 6 inches. That makes answering the question of how many GloFish in a 10 gallon tank a little bit trickier. 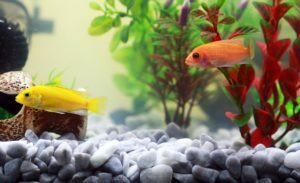 In the following article we will go over each GloFish species, and then we will give our recommendations on how many of each GloFish can be added to a ten-gallon aquarium. The GloFish Danio (Order GloFish online at Petco.com) is a small schooling fish that is the perfect size for a 10-gallon tank. The GloFish Danio will reach a maximum adult size of about 2.5 inches. That means you can comfortably fit up to 5 GloFish Danios in a 10-gallon tank. GloFish Danios are a very social fish that need to be kept in small schools, or with other non-aggressive fish. 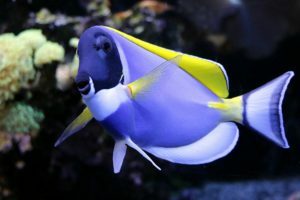 They also prefer to live in a tank with wide open swimming spaces, since they love to dart around and chase their tank mates. 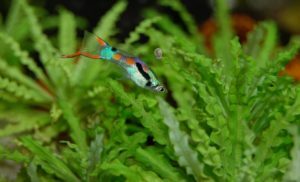 Danios, in general, are very easy to care for and can tolerate a wide range of conditions. They live in water that ranges from 64-75 degrees Fahrenheit, so they can be kept in a tank without a heater. And they are very tolerant of poor water conditions so they are perfect for beginners or anyone cycling a new tank. 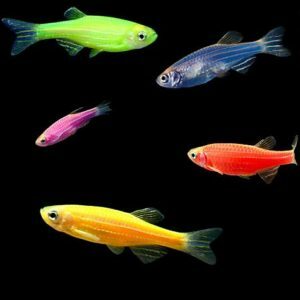 The GloFish Tetra (Order GloFish online at Amazon.com) is a very peaceful, schooling fish that comes in a wide range of eye-catching colors. GloFish Tetras will remain small throughout their life since they only reach a maximum adult size of 2.5 inches. That means you will easily be able to keep up to 5 GloFish Tetras in a 10-gallon tank. Keeping GloFish Tetras is very easy since they get along with all kinds of non-aggressive fish. That makes them a great addition to a community tank, or you can keep them in a species specific tank if you like. And unlike GloFish Danios they tend to be more relaxed and laid back, so they don’t need as much wide open swimming space. 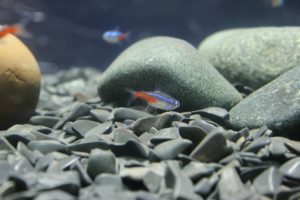 Tetras are a very hardy tropical fish that are perfect for someone who is just starting out in the fish keeping hobby. They are not as cold tolerant as GloFish Danios though since they prefer temperatures that range from 72-82 degrees Fahrenheit. That means you will need to keep them in a tank with a heater. They can also be shy, so you should give them lots of decorations to hide in so they have a place to feel safe. 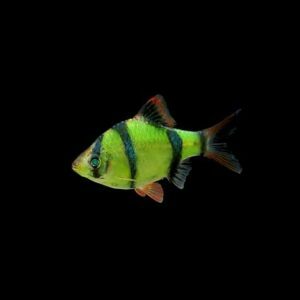 GloFish Tiger Barbs (Order GloFish online at Amazon.com) are a semi-aggressive schooling fish with a big personality. 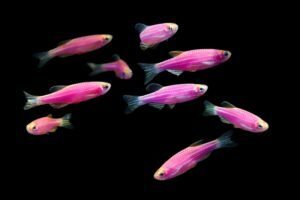 They will reach a maximum size of 3 inches which makes them a little larger than other GloFish. For this reason, you should only keep 3-4 GloFish Tiger Barbs in a 10-gallon tank. GloFish Tiger Barbs are very active fish that like to form large schools, and they don’t always get along with other fish. 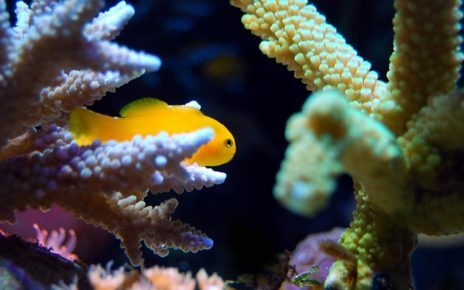 They are known to nip the fins of smaller and slower fish, so when choosing tank mates for them care should be taken. They also prefer to live in a well-planted tank with lots of swimming space. GloFish Tiger Barbs prefer slightly acidic water that stays between 74-79 degrees Fahrenheit. 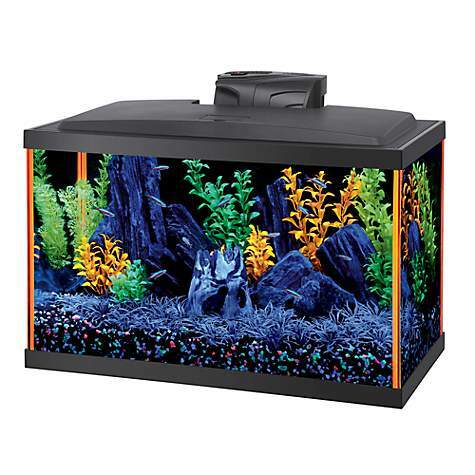 Overall a 10-gallon tank will be fine if you plan on only keeping 3 GloFish Tiger Barbs. But you might want to consider upgrading your tank if you want to have a larger school so you can provide them with the proper environment. The GloFish Rainbow Shark (Order GloFish online at Petco.com) is the newest addition to the GloFish family. 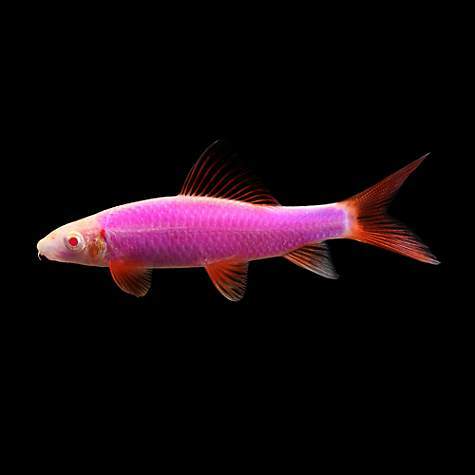 The GloFish Shark is one of the larger GloFish on the market. They can reach a maximum adult size of 6 inches. That means you can only realistically keep 1 GloFish Shark in a 10-gallon tank. GloFish Sharks are a semi-aggressive fish that don’t get along with other sharks especially when kept in a small aquarium. They also need to be kept with tank mates that are larger than they are and fish that share a similar temperament. The GloFish Shark is a natural bottom dweller that will spend most of their time scavenging for food or eating plants and algae. Even though it might be possible to keep a single GloFish Shark in a 10-gallon tank it isn’t recommended. GloFish Sharks are better suited for a 20-gallon tank, but a 55-gallon tank would be even better. 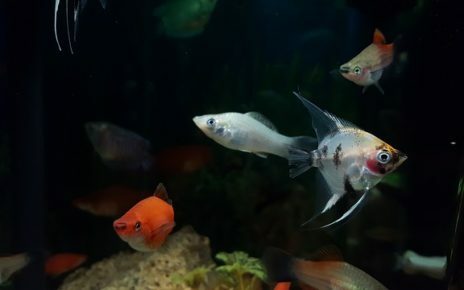 If you really want a GloFish shark you can start them out in a 10-gallon tank when they are small, and then you can upgrade to a larger tank when they start to outgrow the smaller aquarium. 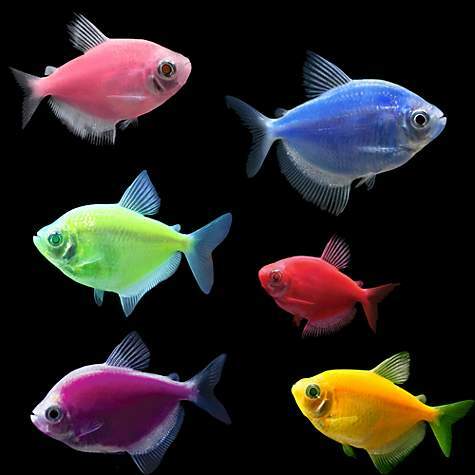 Since GloFish come in a wide range of species there is no one GloFish tank setup that will work for all of them. If you stick to GloFish Danios and Tetras then a GloFish minimum tank size of 10 gallons will be sufficient. If on the other hand, you want to keep GloFish Tiger Barbs or Sharks a 20 gallon or larger tank would be better. No matter what species you get, they will at a minimum need a tank with a filter and other accessories to keep them happy and healthy. And if you get any other GloFish besides the Danio, you will need a heater since all the other species prefer warm water. And if you want the colors of your GloFish to pop, you will want to get a blue light to have the best results in your aquarium. Then to round out your tank you should get decorations and gravel that glows or fluoresces to tie the whole GloFish theme together. The Aqueon NeoGlow 10 Gallon Orange LED Kit (Click to view on Amazon.com) is all you will need to have a perfect GloFish tank setup. This tank comes with everything you will need to care for your fish and to decorate their tank. This tank comes with a low profile hood with blue LED lighting. It also comes with a QuietFlow power Filter to keep your tanks water crystal clear. And this tank kit also includes multi-colored gravel, florescent artificial plants, and a black backing. All these things combined will make your GloFish tank the center of attention in any room. To top it all off this tank has been specially designed with silicone on the edge of the tank that fluoresces under the blue LED lighting. 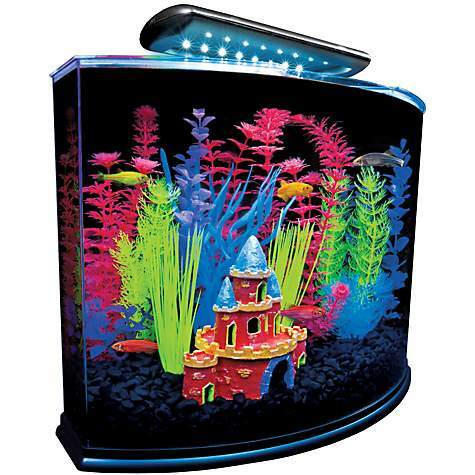 If you want a tank that is ready for GloFish right out of the box this tank is the best option. And it even comes with a sample of water conditioner and food so all you will need to do is add water to get started. 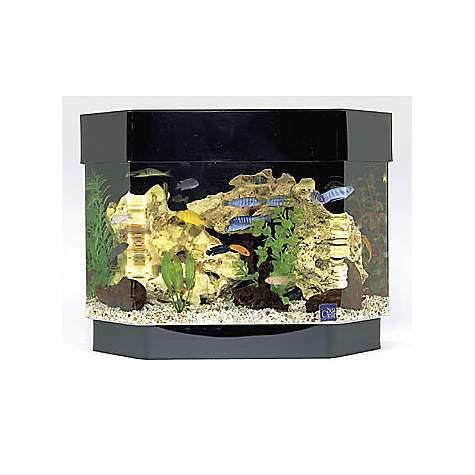 The SeaClear 10 Gallon Mini-Kit (Click to view at Petco.com) is an acrylic tank with a more professional aesthetic. This tank kit comes with everything you will need except the gravel. And this 10-gallon tank will fit into any rooms decor thanks to its designer hood and integrated stand. This tank comes with almost everything you will need to start as soon as you get it. This kit comes with a power filter, plastic plants, net and a sample of water conditioner. The tank also comes with a designer hood with an included light fixture, so you can choose what type of lighting you want to add to your tank later. The SeaClear 10-gallon tank is a beautiful tank that will give you a crystal clear view of your vibrant GloFish from any angle. The enhanced clarity of this tank is due to the fact that it is made of acrylic instead of glass. Acrylic tanks don’t distort or alter the color of light because they are almost perfectly clear and they have a lower index of refraction. The GloFish Blue LED Aquarium Bubbler will add a glowing cascade of bubbles to your GloFish aquarium. This bubbler has 6 blue LED’s that shine up through the bubbles to create a mesmerizing dancing display of light that will flicker and shimmer all over your aquarium. This bubbler will also keep your tanks oxygen levels elevated since it emits a strong stream of medium to large bubbles. And it can be placed inside ornaments or in dense plantings to enhance the lights effect. All you will need to run this bubbler is an air pump and a check valve, and then you will be all set for the beautiful light show. The GloFish Cycle Light is the best light if you really want to show off the colors of your GloFish. This light clips on to the frame of your tank for easy installation. That means you can use this light as supplemental lighting, or you can add this light to a new tank as a primary source of illumination. 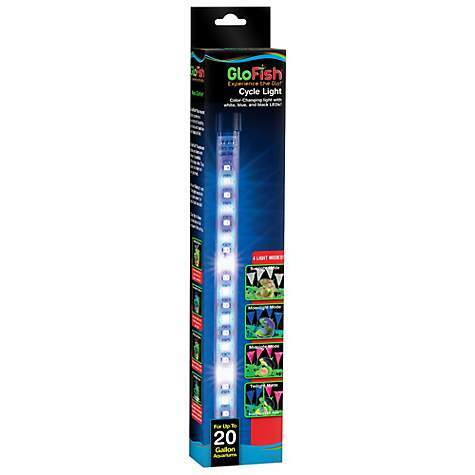 The GloFish Cycle Light has 4 different lighting modes, and each one brings out different colors in a GloFish aquarium. 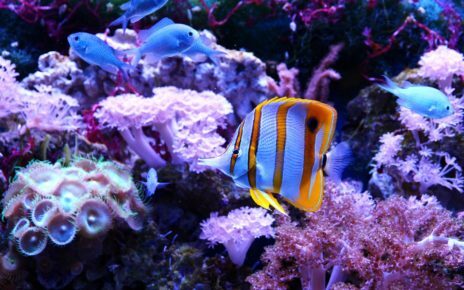 The first mode is sunlight mode, which has a more balanced color spectrum that will brighten up everything in your aquarium. The second lighting mode is Moonlight mode that will make your GloFish and decorations fluoresce. Then you have midnight mode, this mode makes GloFish color changing decorations alternate their colors. And finally, you have the twilight mode that switches between moonlight and midnight mode. Twilight mode cycles through the spectrum to make both your GloFish and decorations as vibrant as possible. 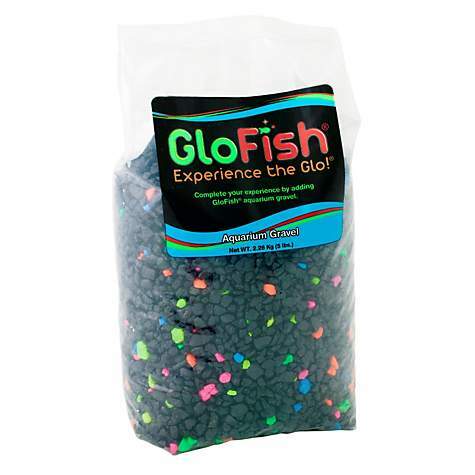 The GloFish Black Multi-Color Lagoon Aquarium Gravel is the gravel of choice in most GloFish tank setups. 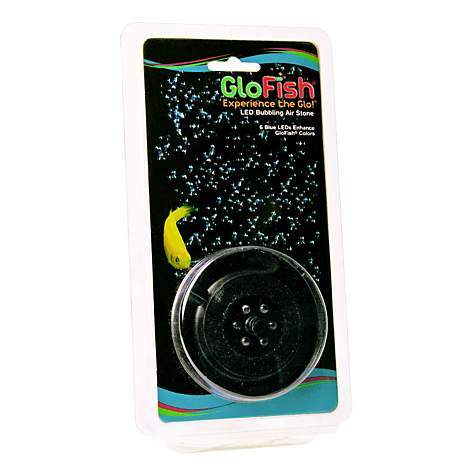 This product will accent the color of your GloFish with a mix of colorful fluorescent pieces of gravel. You can get this gravel in dark and light colors. The dark gravel is great for a more dramatic effect, or you can use the light gravel if you prefer a more vibrant environment. If you want you can mix this gravel in with regular rock based gravel. This will let you maintain a more natural look in your tank with the added pop of the brightly colored gravel. Or you can mix the light and dark colored GloFish Gravel to create a custom blend of gravel to match your tanks decor. The GloFish Yellow Anemone Ornament will make the perfect hiding place for your GloFish. This plant is yellow in color under normal light, but when it is exposed to blue light it will fluoresce in a bright green color. And unlike most artificial plants this one is soft to the touch, which means if you add this plant to your tank you won’t have to worry about your fish getting scratched or injured. 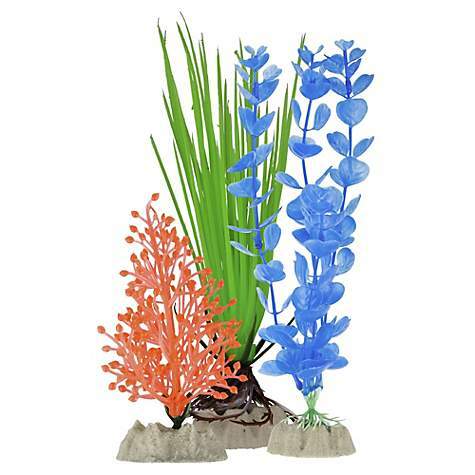 If you want a large plant that will act as a centerpiece in a small GloFish tank this ornament is a great option. 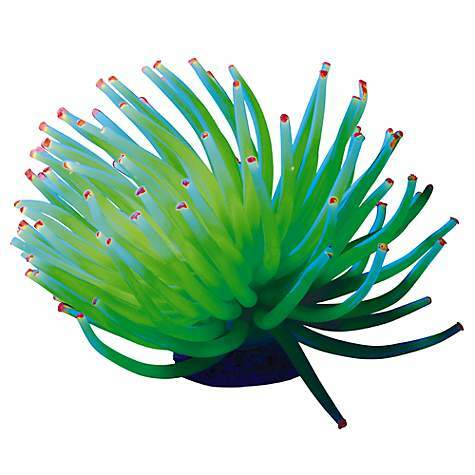 This vibrantly colored ornament is meant to mimic the look and texture of a real Anemone, so now you can bring some marine flare to your freshwater aquarium. The GloFish Multi-Pack of Aquarium Plants is great if you want to quickly fill out a GloFish tank with decorations. This pack consists of one small and two large artificial plants. These brightly colored plants will fluoresce under blue light, so they are sure to draw anyone’s attention. The smaller plant can be placed in the foreground of an aquarium to frame out your design. And the larger flowing plants can be added to the back of the tank, to create a lovely background in your GloFish aquarium. And since these plants are so affordable you can buy multiple packs to create the look and feel of a densely planted aquarium. Do GloFish Need a Filter?